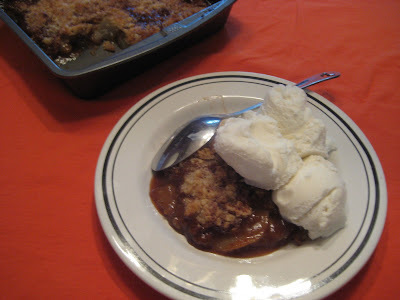 Yes, yes, I know everyone always think of apples when they think of a fruit crisp (or crumble if you're from the UK), but I wanted to show you how easy it is to use a different fruit and get an equally delicious dessert. This recipe lends itself to any number of fruits or fruit combinations. Try raspberries, blackberries, and mangoes. Also try peaches with blueberries or strawberries with rhubarb. Peel, core and slice the pears. Gently toss in a bowl with lemon juice. In a separate bowl, combine the brown sugar, cinnamon, and nutmeg; add to the pears and toss to combine. In another bowl combine flour, sugar and oats. Cut butter into flour with a pastry blender or two forks until mixture is crumbly. Stir in the chopped nuts (if using). Butter a 9-inch square baking dish. Spread pear mixture in bottom of baking dish then sprinkle with flour mixture. Bake at 375° for 30 to 45 minutes, or until pears are tender and topping is lightly browned. If your pears are really juicy (as mine were), just add a touch more flour or let it bake for a while longer so it'll caramelize and set up a bit more.